I never know what will move me to write a blog. The inspiration comes from anywhere and everywhere. And it's amazing how much of this random inspiration relates to parenting! Walking by the dishboard this morning, I noticed a new water-bottle lying there. Black with white lettering. Hardly revolutionary. Then I read the words. 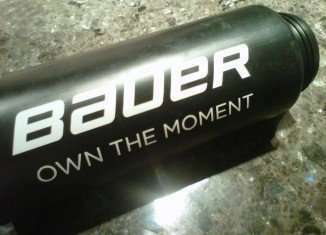 It's a bottle from Bauer, and underneath the brand name the words, 'OWN THE MOMENT'. Notwithstanding how much I adored the 2010 Olympics motto that Canada adopted (also a program) called, “Own the Podium”, this other ownership tag line really struck a chord with me. OWN THE MOMENT. So relevant. As someone who strives everyday to really live in the moment (infinitely easier said than done with the litany of distractions that steal our attention), I could relate to the inherent meaning behind these words. As someone who continually strives to raise their own personal bar, I could relate. As a parent who tries to get our three offspring to gently raise their own personal bars every day, this tag line is brilliant and absolutely relevant. In short, I see OWN THE MOMENT as an ongoing personal challenge. Don't get me wrong, we are not trying to raise Olympians here, but if each of us is not trying to be better in some way every time out, than what is the point really? By owning it, you have staked your vested interest in whatever that IT is. That's what is so great about it, especially from a parenting point of view. Perhaps I have a penchat from brilliant three-word tag lines spewed out by the genius marketing minds behind global brands. 'JUST DO IT' is my other favourite tag line, from NIKE of course. As someone who is all about execution, this one is me in a nutshell. I now have a guiding force mantra, OWN THE MOMENT, aka, 'carpe diem' or 'Seize the Day' (from among other things, 'Dead Poets' Society' my all-time favourite movie). Gotta go now, to do just that!